Look! Nothronychus! The only way I was able to make this animal look in any way reasonable, I took a few liberties with its design. First, it's got big legs. Why? Because when they were any slimmer, they ended up looking silly. 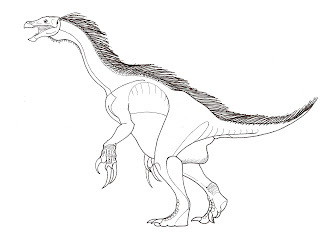 Note also that he's got more sauropod-esque feet, what with those big dermal pads under the metatarsals. I've also given him a light covering of "quills" down the back. I imagine him flaring his quills to intimidate predators. If I have time today (I actually don't), I may draw Falcarius in a threat display. Gonna color him later tonight, just in time for the Art Evolved show tomorrow! i'm currently having massive trouble figuring out where i want the feathers to go on mine!